Each month we are getting to know our allotment neighbours a bit better. For March, we have been chatting to Mary Enache (nee Thorp) who has a plot 23/24 at the Hertford allotment site. This month I’ll be clearing all the beds of weeds etc., raking in Blood, Fish & Bone and mulching with Country Natural manure. Also pruning apple and pear trees, cutting down autumn raspberries, tying in blackberries, summer raspberries and Tay berries and tidying up strawberry plants before forking in Blood, Fish and Bone and surrounding with manure. Already in the ground: Rhubarb, Globe Artichokes, Asparagus, Japanese Onion sets, garlic, and Broad Beans, Swiss Chard, Lovage and other perennial herbs. I’ll be growing this year: More Onions, Leeks, Perpetual Spinach, Tomatoes(cherry, medium and beef), Courgettes, Peppers, Chillis, French Beans (climbing and dwarf), salad crops (Lettuce, Rocket, Radish, Spring Onions), small pumpkins, Peas, Mangetout, Runner-Beans, Aubergine, Potatoes (first, early and main crops) Sweet-Corn, Parsnips, Carrots and Kohlrabi, Florence-Fennel and other annual herbs (Dill, Parsley). Constantin my Romanian husband does the cooking. Romanian Potato Cake (grated potatoes, chopped onions, dill, grated cheese and eggs, sliced tomatoes……. And Vegetable Soup flavoured with lovage, dill, garlic, Bors (a liquid made from fermented maize leaves and rye bread) and Zacusca (a paste made from tomatoes, onions, carrots, garlic, chillis, aubergines, peppers). Local and garden history and all things Romanian. And I love to cook when Constantin allows ( he really likes roast parsnips with rosemary). Each month we are getting to know our allotment neighbours a bit better. For January, we have been chatting to Sheena Clark who has a plot 2 at the Pavilion allotment site. I have had an allotment since August 2016, we were originally on Triangle site which was a lovely little plot but moved at the beginning of Autumn to Pavilion to a bigger plot. This month we have tidied up, raked up the leaves and kept the bird feeders topped up. This year we had a great crop of tomatoes but they were very slow to ripen. Beetroot, raspberries and cucumbers also did really well. The flowers were good too especially the Dahlias. We grow fruit, veg and flowers, we don’t grow any fruit or veg that won’t be eaten, peppers, cucumbers. raspberries, rhubarb, beetroot, apples, pears, plums, potatoes, carrots just the usual really. I make chutney’s, and jams with our harvest. standard recipes that my family have used for years. I love my allotment, its our outside space as we live in a flat, I can quite often be found just sitting on the bench on a nice day, on the not so nice days I can be found in a different sort of tree as my other hobby is genealogy (family history) which I really enjoy. Each month we are getting to know our allotment neighbours a bit better. For December, we have been chatting to Paul Crompton who is at plot 62 at the Priory allotment site. This month planting onions, garlic, one or two new shrubs, cutting back big blackberry bush, facing cutting back lots of raspberry canes which did not produce fruit last 12 months because drought and unusual weather. Blackberries did well but raspberries a big zero. Just planning to improve growing conditions at present and not sure about 2019 except hoping for better weather. 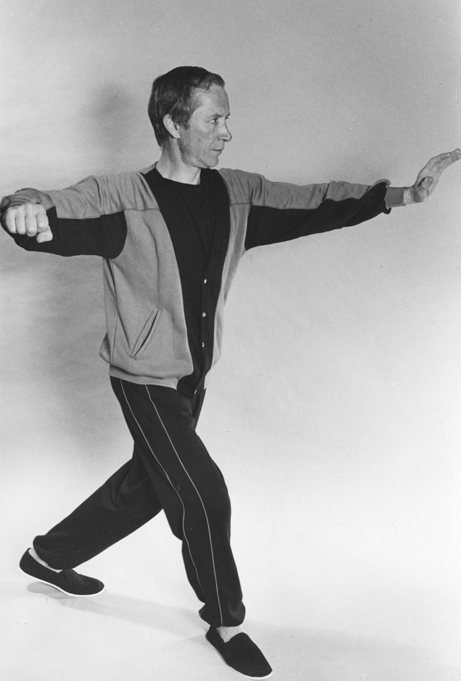 I am a famous tai chi teacher – look me up on internet, author and translator in field of martial arts. Currently teach half a dozen elderly groups around southwest London. Each month we are getting to know our allotment neighbours a bit better. For November, we have been chatting to Dino and Sarah Franz who are at plot 30a at the Hertford Avenue allotment site. After almost five years on the waiting list, my husband was offered his first allotment late this past summer at Hertford Allotments. The plot had been left untended for quite some time, but luckily some of the site reps and volunteers, had kindly cut down many of the taller weeds to prevent seeds from spreading; old plastic was also covering some of the existing raised bed. After several weekends of digging and clearing, we put down new wood chip on the old existing paths and brought in two tons of compost to bring up the soil levels within the beds; within three weeks of getting the allotment keys, we planted our first two plants: green beans and swiss chard. (And this was much to the delight of the young allotment foxes, who immediately dug everything in that one single bed every other night for a couple weeks!). We found a shed and fence panels on offer on Freecycle and put those up. As the beds were cleared one after the other , we planted some purple sprouting broccoli, perpetual spinach, and parsnips; we also just removed our (inherited) dahlias after the first frost. 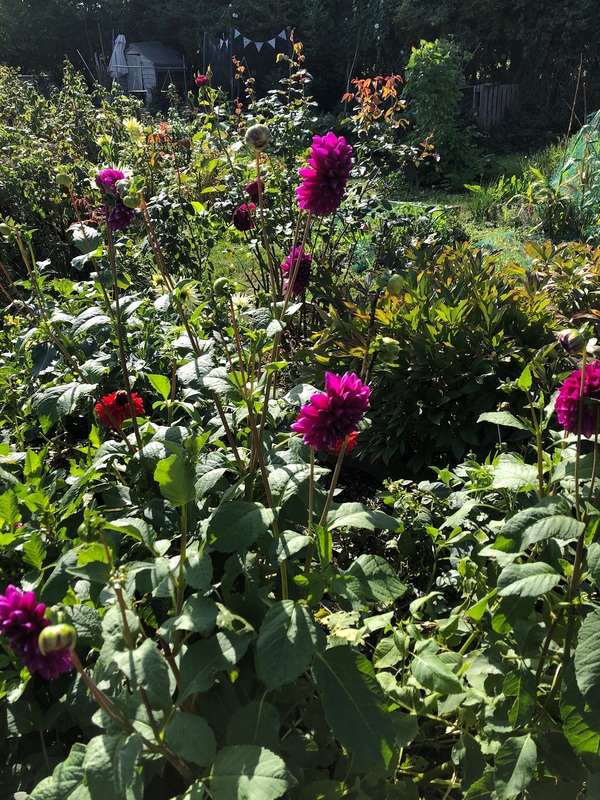 We knew we had quite a few dahlias, but when clearing the beds, we ended up with 20 plants we hope will regrow next year! This month has been clearing the remaining beds for the over winter plants; planted out all of our over wintering garlic and popped in some radicchio, we also finished putting up the last of the fence panels and hope to finish shelves in the shed in the next few weeks. This year, the crop that did the best was our inherited dahlias followed closely by our green beans – next year will hopefully have a wider variety! Along with the dahlias, we’re also hoping the existing gooseberry and raspberries plants will also come back next year along with a few asparagus plants we know are lurking in one bed! We are looking to plant onions, leeks and to get a few squash plants on the go, and maybe even some flint corn. Dino cycles and Sarah runs marathons and also loves website design (and redesigned the BHAS website earlier this summer). Each month we are going to be getting to know our allotment neighbours a bit better. 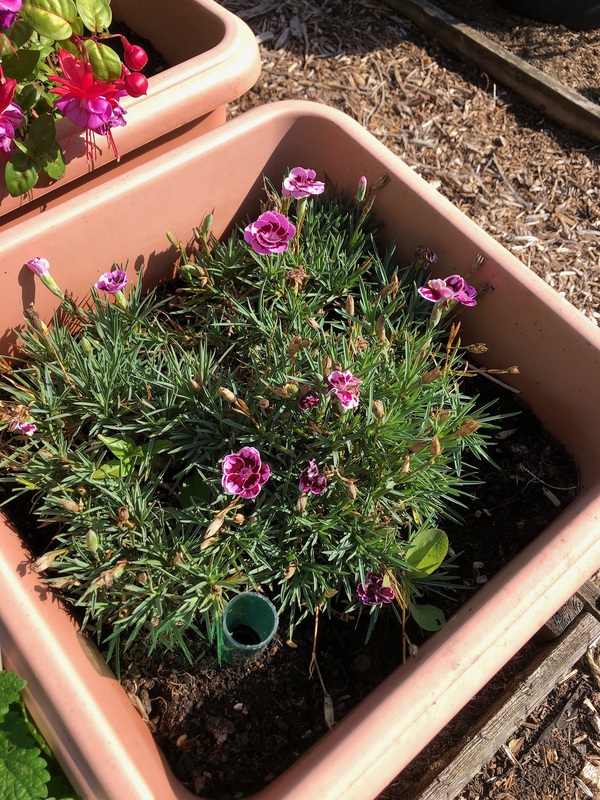 For August, we have been chatting to John Padgett, who currently volunteers as the BHAS Chairman, and is at plot 41a at the Hertford Avenue allotment site. I’ve had an allotment for 5 years now. I feel the growing of fruit and vegetables is one of the most primitive of human activities and it’s all too easy nowadays to bypass any connection with how our food is grown. In our busy, compressed lives, the allotment is a peaceful oasis. Watering, picking raspberries, feeding my pumpkin and more watering! My crop of Garlic (Sprint) did well this year. It must have enjoyed the relatively mild winter and wet spring. The raspberry canes (Joan J) have also done well and I collect about half a large punnet every other day at the moment. At the moment it’s got to be Fresh Raspberry Meringues. I buy the meringues for simplicity then just top with whipped cream and heaps of fresh raspberries – it’s the perfect way to finish a meal on these hot summer days. Our thanks to John for taking the time to answer our questions this month and provide a look into his allotment world. If you’d like to be interviewed for next month’s newsletter, please contact us!